Green in Manchester - Vanessa Hall: Is it in the bag with Brown? Is it in the bag with Brown? I read today the laudable words of Gordon Brown on the subject of plastic bags. 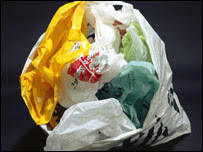 Gordon Brown has warned retailers he will force them to cut down on plastic bag use if they do not act voluntarily. Great Gordon, but why wait? Why does Brtain so often seen as the Dirty Manc of Europe continue to lag behind when countries like Ireland lead the way with their recent ban on plastic bags. It is inly when legisaltion comes in that a level playing field is created to ensure that all retailers can charge for bags without smaller businesses losing out. The big chains will benefit from the publicity as they cash in on their Greenwash, only legislation to cover all shops is a fair way to deal with the problem of single-use plastic bags. And what next for the nations shopping? Paper bags as we see in America? Let's hop not because recent studies have shown that the production and transportation of paper bags causes more climate change emissions that the single-use plastic bag they seek to replace. This is one of several environmental conundrums where our elders truly know better, re-usable shopping bags like Granny used to use. End Manchester to London flights now!